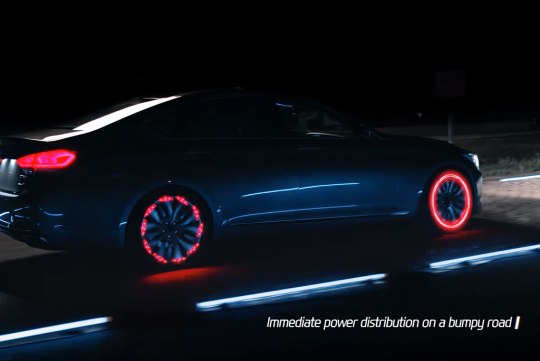 While the Hyundai Genesis we get here is only available in rear-wheel drive, other countries do get it in all-wheel drive and Hyundai is more than willing to show it off in its latest ad. With the help of some cool LED lights and some video editing, its clever HTRAC all-wheel drive system can be understood and seen working by almost anyone. For those who still don't get it, the video tries to demonstrate how the HTRAC system adjusts power distribution on the go in all types of road conditions, such as wet surfaces and bumpy roads. With the help of the lights that rotate around the rims, one can see which individual wheel is spinning faster than it should before the system gets hold of it loosing grip. Hyundai Genesis is a very good car,too bad the engine CC too big,if they put a 2 litres Turbo engine,it will be better.